Looking for cheap car hire at Sacramento, California? Check and compare quotes from a range of car hire companies with pick-up services available at all major airports. Select the date and preferred pick-up location in Sacramento, the drop off location and period of hire, type of vehicle needed and the age of the youngest driver then press enter and compare quotes from a large number of available rental cars that can be easily booked online. Although there are bus services and Amtrak rail lines travelling across Sacramento, one of the best ways to see the city and surrounding districts is by renting a car and self-driving. Sacramento International Airport is situated just 10 miles northwest of the city centre and handles flights from all over the US, including Hawaii, as well as some cities in Canada. The airport has an array of services and is a major pick-up point for hire cars. 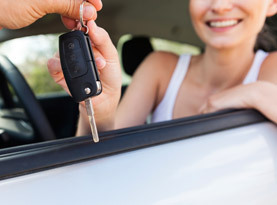 Booking your rental car online well in advance will ensure you get the cheapest car hire rate available. After collecting your rental car from your preferred location, Sacramento has much to offer visitors with a host of museums and galleries including the Crocker Art Museum, California Museum for History and Leland Stanford Mansion State Historic Park. The surrounding region of Sacramento is prime agricultural land, with scenic national parks to explore and picturesque vineyards to enjoy. At the foothills to the Sierra Nevada Mountain Range are stunning land formations and beautiful views of the region. The Sacramento River provides a pleasant place to relax with outdoor activities such as trout fishing and kayaking and is accessible by hire car. Sacramento experiences cool and wet winters followed by hot and dry summers. June and July are the hottest months with temperature often reaching 35°C, while from December until February temperatures drop to around 5°C.